Photograph taken by Nicholas and Co in ca. 1880 at Mahabalipuram (Mamallapuram) in Tamil Nadu, showing a sculptural frieze of Durga seated on a lion, shooting arrows at Mahishasura. Most of the temples and art at this site are ascribed to the reign of the Pallava king Narasimhavarman I (ruled 630-about 668 AD), from whose title of Great Wrestler or Mahamalla the place derives its name. 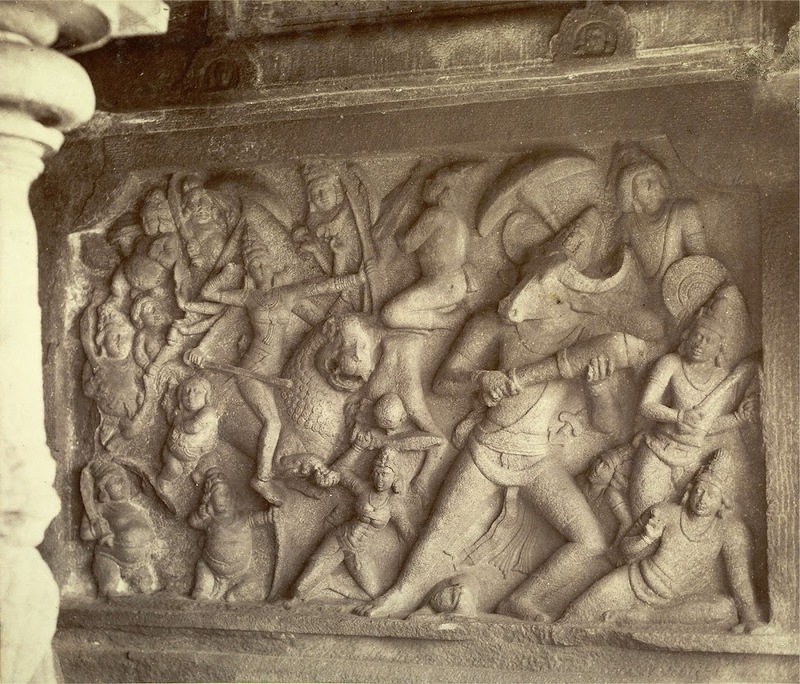 The Mahishasuramardini cave temple takes its name from the huge sculpture panel on its walls celebrating the feat of the goddess Durga (a form of the Mother Goddess Shakti) who slew the buffalo-headed demon Mahishasura. With its naturalistic dynamism and beauty the panel is considered to be a masterpiece of Indian art.